From Steven Vannelli, CFA: Stock and currency markets often take their cues from the credit markets, so we find it instructive to keep a close eye on credit spreads and credit default swaps (CDS). 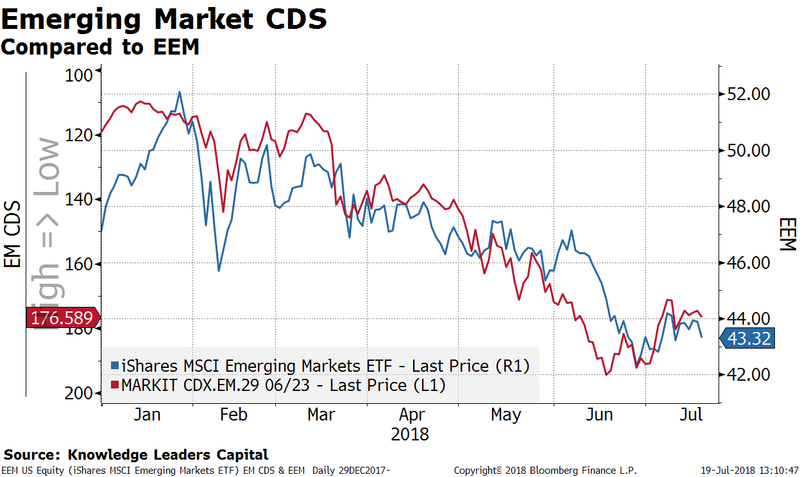 Looking at the credit markets in the emerging markets, we think there may be initial signs that the storm that has engulfed emerging market assets may be over. 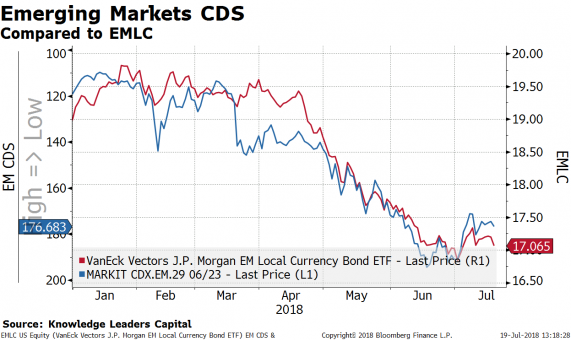 Let’s start with a review of emerging market CDS. 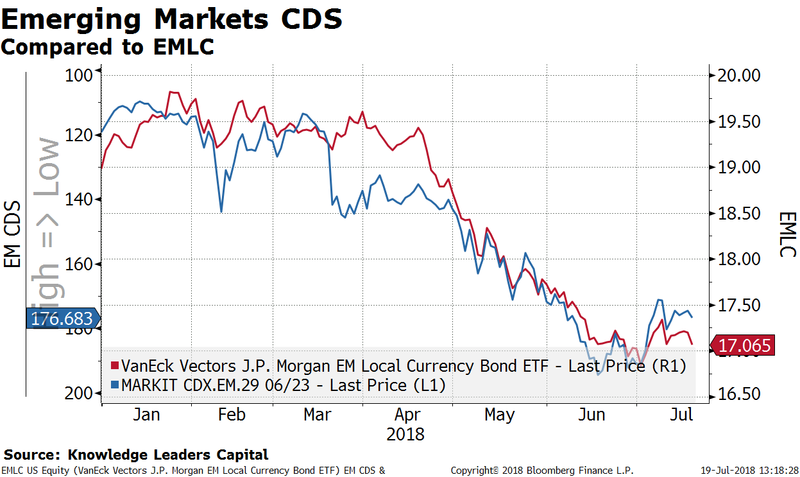 In the next three charts we compare the year-to-date move in EM CDS to EM currencies, EM stocks and EM local currency bonds. 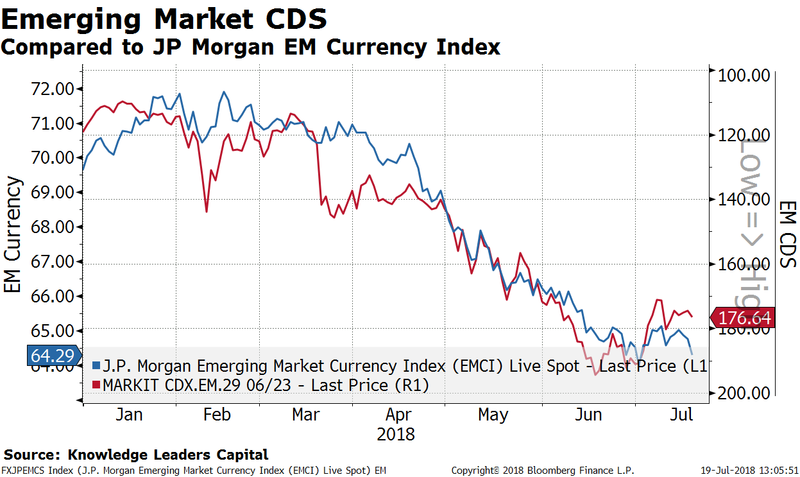 After peaking at 193bps on June 19, 2018, EM CDS have backed down about 15bps to 176bps (red line, inverted). CDS successfully tested the highs on June 27 at 192bps. 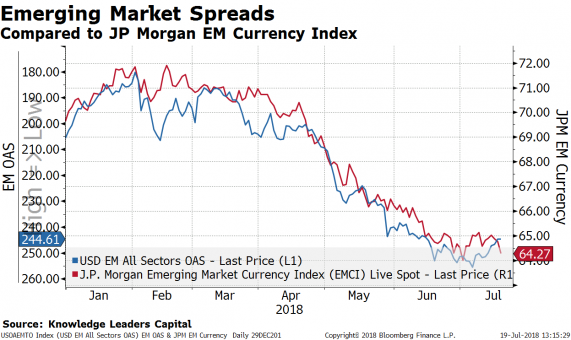 On that day emerging currencies, represented by the J.P. Morgan Emerging Market Currency index (blue line), made their lows also. On that same day, emerging market stocks made their lows. 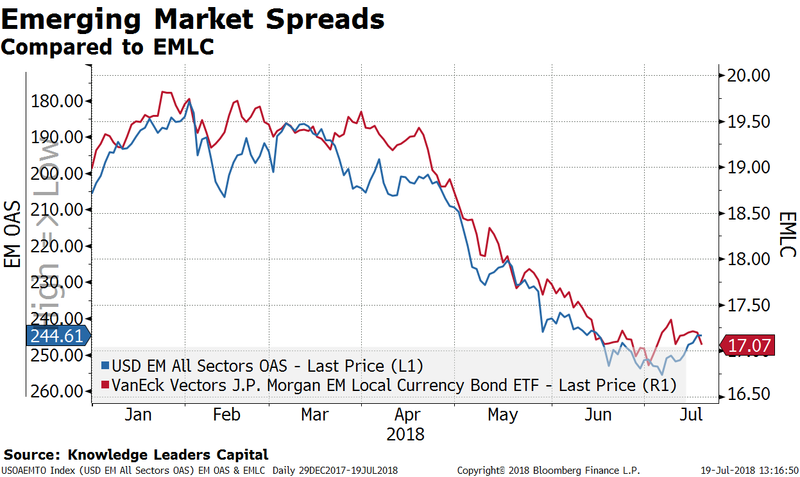 And, emerging market local currency bonds, as represented by the VanEck Vectors J.P. Morgan EM Local Currency Bond ETF (EMLC) made their lows as well. 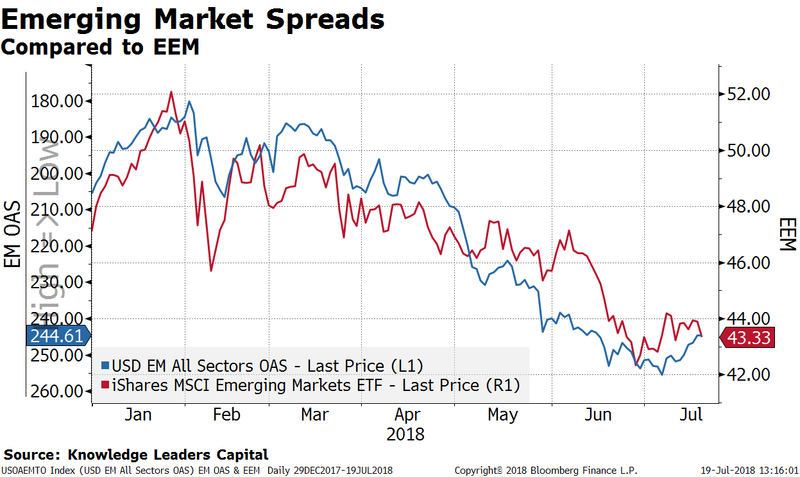 Next, let’s review the same comparisons, this time using emerging market option adjusted spreads (OAS). 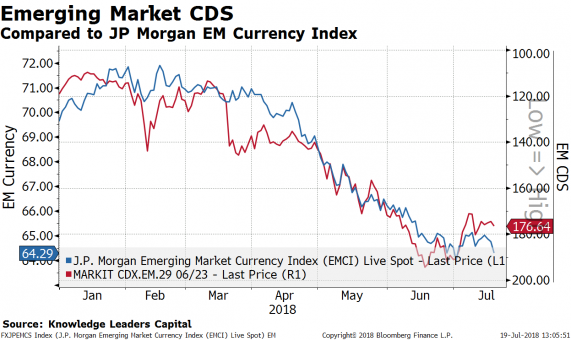 Emerging market OAS peaked about a week later than the CDS on July 6, 2018 at 255bps. Since then, spreads have come in by about 11bps to 244bps (blue line, inverted). 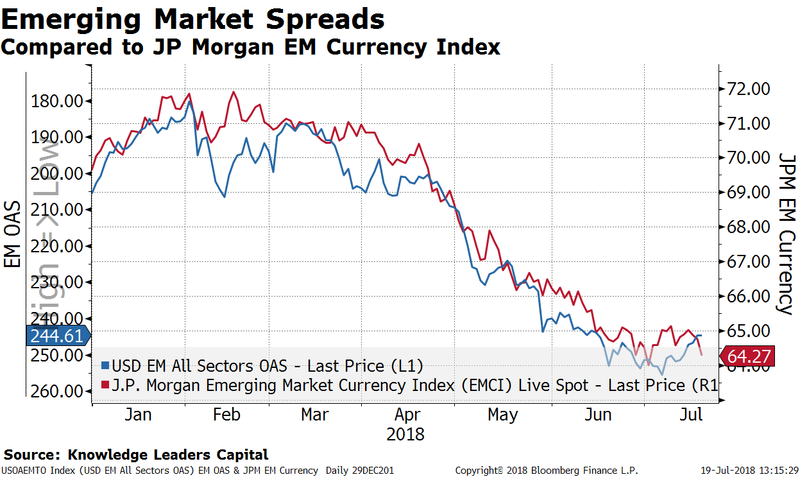 So far, the bottom in EM OAS is providing a floor for EM currencies, stocks and bonds. 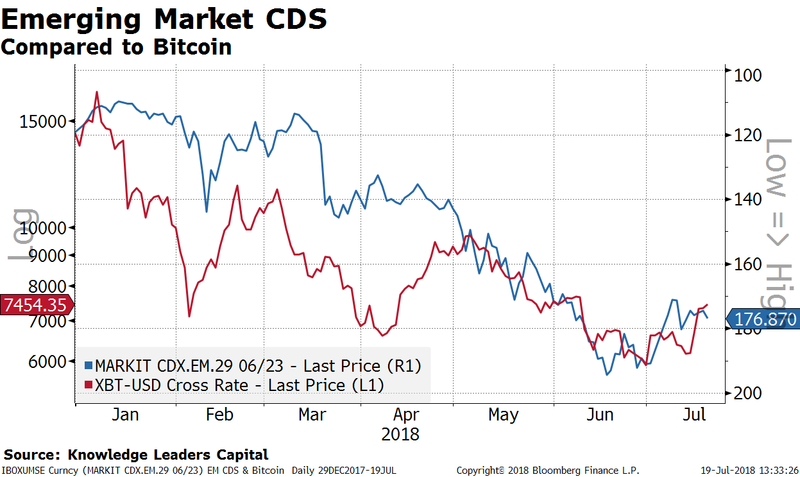 Interestingly, the recent surge in Bitcoin also corresponds to the peak in emerging market CDS. Bitcoin made a low of $5,899 on June 29, 2018, two days after the successful test of EM CDS. Since then it has rallied about 25% to $7,452. The last piece I would like to see is gold make a bottom. 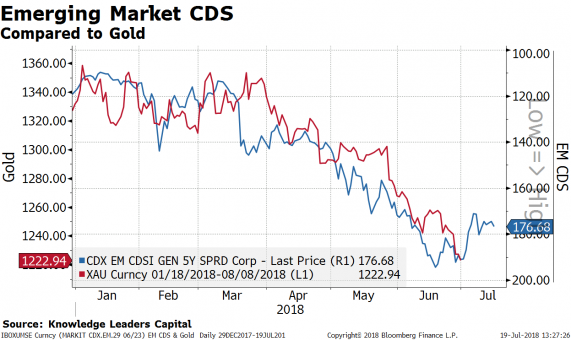 I have observed that gold tends to lag emerging markets CDS by about 20 trading days. So, in this last chart I plotted gold against emerging market CDS and if this relationship holds, today may be the low in gold, corresponding to the June 27 test of emerging markets CDS. 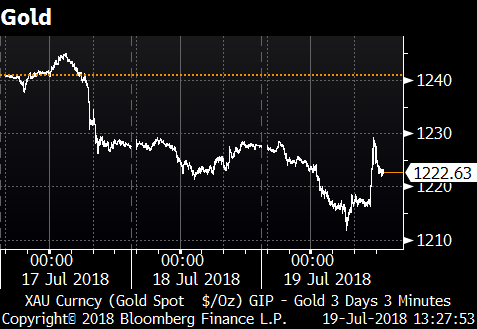 Gold made an intraday low today at $1,211 and has bounced back to $1,222 as of this writing. 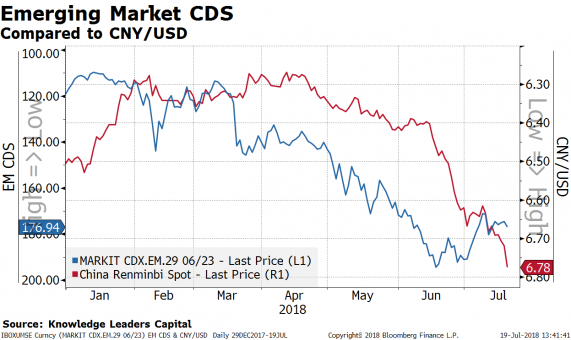 The rise in emerging market CDS and OAS have been accompanied by the backdrop of a rapidly weakening Chinese Yuan. Perhaps the most re-assuring aspect of this analysis is that today, as the CNY makes new lows around 6.78, EM CDS, OAS, currencies, stocks and bonds are holding above their respective peaks/troughs. 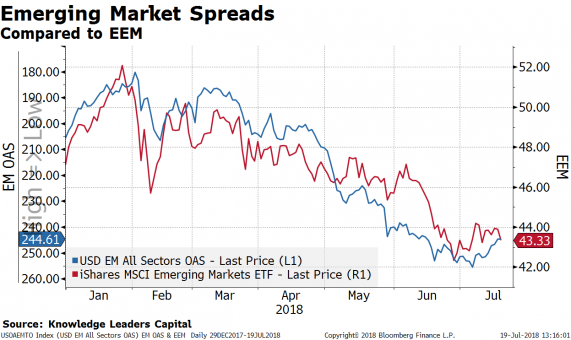 Emerging market assets have been caught in the cross-fire of the US-China trade war as China responded to the imposition of tariffs by collapsing its currency. Has China’s stranglehold on emerging markets assets ended? To the extent emerging market CDS and OAS hold above their recent lows, this would be a great indication that the worst may be over for emerging market currencies, stocks and bonds. 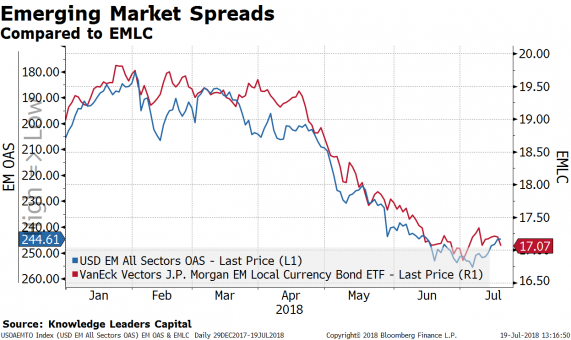 As of 6/30/18, the VanEck Vectors J.P. Morgan EM Local Currency Bond ETF was held in the Knowledge Leaders Strategy. The iShares MSCI Emerging Markets Indx ETF (EEM) rose $0.46 (+1.06%) in premarket trading Friday. Year-to-date, EEM has declined -8.02%, versus a 5.34% rise in the benchmark S&P 500 index during the same period.